Slumps, Grunts, Cobbler, Crisps, Crumbles, Pandowdy, Buckles and Betty’s. They’re all old-timey names for some of our best-loved fruit desserts. But can you imagine the joy that grandma would experience (when no one was watching, of course) if she knew she could cut up a few apples, open a can of biscuit dough and end up with the most scrumptious dumplings in no time? The canned biscuit dough makes it convenient and the caramel liquid is the magic that makes these treats irresistible. What a nice combination! I did quite a bit of experimenting and discovered that if I used the large biscuits, like the Pillsbury Grands, I can peel each biscuit apart and get two perfect dumplings! The sauce is so easy; just heat some butter, sugar, vanilla and a few spices, then pour it over the dumplings, allowing them to just sit and soak up all the sweet and buttery goodness from below. The real secret is to reserve some liquid so that you can baste the dumplings several times during the cooking process. That will allow you to get that gorgeous deep golden glaze on top! (I also dunk a pastry brush into the baking dish during cooking to get a little of the apple flavor.) Save this recipe as a sure fire quick and easy dessert you can whip up with very little effort. Don’t forget the vanilla ice cream or whipped cream on top! 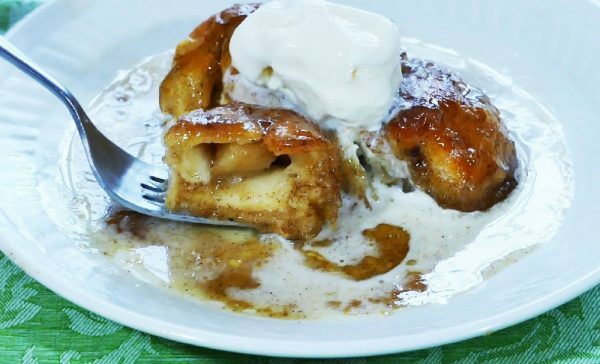 Check out my How To Video for Apple Biscuit Dumplings here!